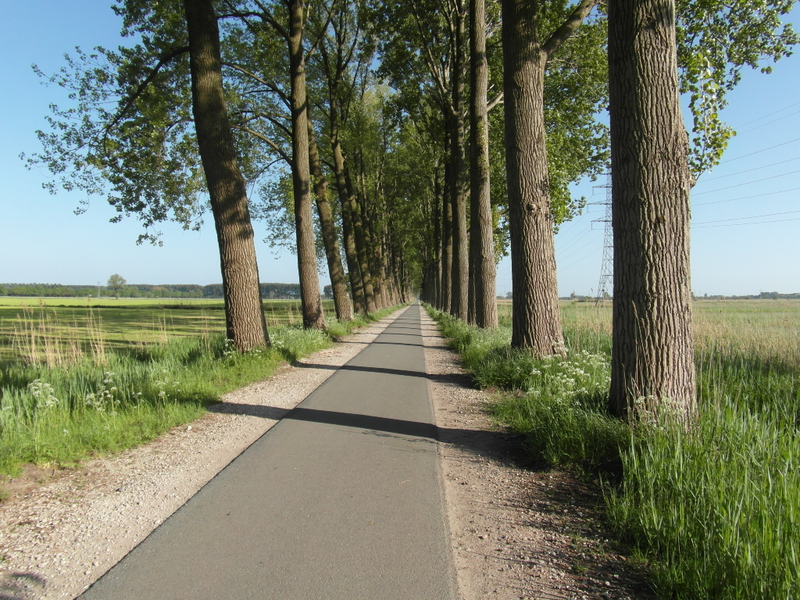 This is an all-day cycle route across the Netherlands, from Amsterdam to Zyfflich, the nearest place in Germany. It is 129 km to Zyfflich, and then 10 km back to Nijmegen station, to return by train. The route is relatively straight (34% longer than the great circle), yet passes through several historic towns and cities, such as Weesp, Amersfoort, and Nijmegen. It crosses some main landscapes of the Netherlands – the reclaimed peat bogs and lakes in the west, the glacial ridges, and the Rhine flood plain. You need a whole day for this route, in summer, preferably with west or north-west wind, or no wind at all. It will take at least 12 hours. Return by train from Nijmegen: the last direct train is at 22.43. You pass shops about every 15 km. If you want to spread the route over two days, Amersfoort is the best place to stop on the first day. Revised April/May 2018.
start on the Dam or “Dam Square”. The present Royal Palace is the former City Hall, completed at the height of the city’s glory in 1665. The original Amstel dam which gives the city its name, was located between the National Monument and the Bijenkorf department store. (The river flowed toward the present site of Centraal Station). go into the Damstraat, to the right of Hotel Krasnapolsky. Go on along this narrow street, which changes its name at each bridge. at the end of the Nieuwe Hoog straat, turn right along St. Antoniesbree straat. Go on into Jodenbree straat. at the end of Jodenbree straat, turn left at the zebra crossing, and then right, toward the building with the green facade. pass this building, the Amsterdam film school (Filmacademie). The two-way cycle path ends here: cross to the other side of the road, to continue alongside the tram line. Follow the cycle sign for Artis. cross a bridge, pass a grassed section of tram track, and then go straight on, along Plantage Midden laan. after the zoo, at the end of Plantage Midden laan, go on across two bridges. From the second bridge, turn left, following the cycle sign for Diemen. pass the Tropical Institute and the Tropen Museum, and keep right on the cycle lane, again following the cycle sign for Diemen. cycle on along Linnaeus straat, the route of tram line 19. Pass under a railway bridge. look out for the HEMA store: as you reach it, at Transvaal straat, turn left across the tram line. You go into Oranje Vrijstaat kade. pass the new shops, and go on along the quayside, past the new housing. At the end, just before the railway line, turn right across the bridge. just after the bridge, turn left along the cycle path, passing under the railway. pass the Praxis store, stay on the cycle path. At the traffic lights, go straight on alongside the canal. cycle on alongside the canal, a ring canal around a polder. Pass new housing, and then the Amsterdam Science Park. The windowless buildings are data centres. after the small run-down houses, follow the LF20a signs, turn left, and then right, onto the dike of the Amsterdam-Rhine Canal. cycle on along the canalside road, under the A10 ring motorway bridge, and under a new cycle bridge. (This section is shared with Route 4). at the 19th-century redbrick house, nr 553, you leave Amsterdam. Go straight on, along the canal bank. pass right the 1990’s housing of Diemen-Noord, then a park (converted farmland). Behind the trees, on the left, is Amsterdam’s newest suburb, IJburg. pass floodgates, separating the Amsterdam-Rhine Canal from the Diem, a former tidal creek. Continue under the new arched bridge, linking IJburg to the A1 motorway. pass under the triple-girder motorway bridge, and then another motorway bridge (opened 2016), and continue along the canal bank, to the railway bridge. about 50 m before the arched rail bridge, turn right, follow the sign for Almere/Weesp. Cycle up to the embankment, and make a U-turn to the bridge. cross the 4-track bridge: this is the main line to Amersfoort, the eastern Netherlands, and Berlin. continue along the cycle path, parallel to the rail line, away from the bridge. Further on, cross the road at the underpass, but continue on this side of the rail line. Follow the sign for Hilversum / Almere. pass Weesp station. At the roundabout, turn right, through the underpass under the rail line. 150 m further, turn left, and then go along the waterside road. This is the river Vecht, which once flowed into the sea at Muiden. The Vecht is a distributary of the Rhine. In its original course it, diverged at Utrecht from the Kromme Rijn, itself a distributary of the Nederrijn or Lower Rhine. You will cross the Lower Rhine 80 km further on. Distributaries are characteristic of a river delta. at the next corner, turn left across the lifting bridge, to continue along the riverside road. turn second right into Slijk straat – you might not notice the first side street. Then turn second left into Nieuwstraat. Food: shops / baker. continue along Nieuwstraat, and pass the late-mediaeval church of Weesp, built 1462.
at the old Town Hall (nr. 41, built 1776), turn right. Cross the next bridge, and turn left along the canal (Nieuwstad). continue along Nieuwstad. After the last house, you can see two windmills on the left. Turn next left into Utrechtse weg, toward the windmills. The water here, and the grassed mounds, are the moat and bastions of fortified Weesp. The town first belonged to the Prince-Bishopric of Utrecht, but was later conquered by the Counts of Holland. They fortified it as a border town, at first a defence against Utrecht, and it retained a defensive function until the Second World War. It formed part of three successive defensive lines, the Holland Water Line in the 17th century, and the New Holland Water Line and the circular Stelling Van Amsterdam in the 19th century. The wooden houses at the beginning of the Utrechtse weg were built inside the military zone, on condition that they could be set on fire in wartime. 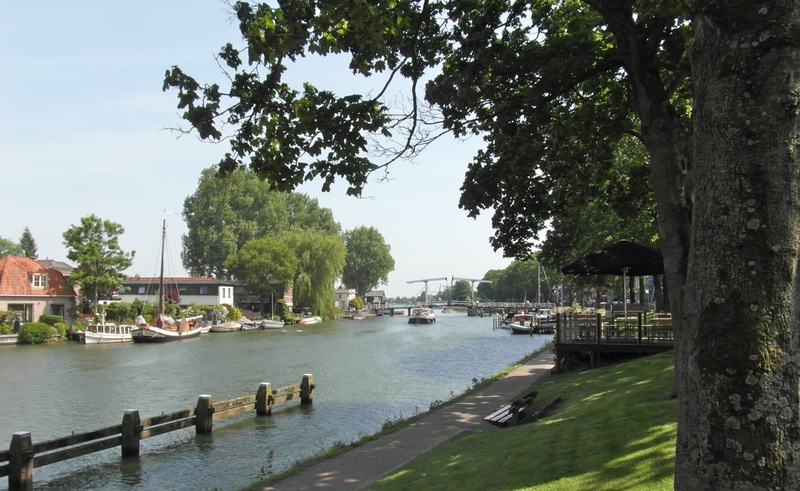 continue parallel to the Vecht, passing the two main windmills of Weesp, De Eendracht and De Vriendschap. Beside the first windmill is a waterside open space to rest. at the end of Utrechtse weg, after nr. 118, turn right into Lage Klomp weg. The other road here is a dead end. at the roundabout, turn left along the main road (N236), towards a new bridge. The road was rebuilt in 2017.
cross the new lifting bridge over the river Vecht, and then turn right at the roundabout. Follow the signs for Nederhorst den Berg. cycle on alongside the Vecht. After 1500 m, turn off left, follow the cycle sign for Hilversum. pass a small car park, go on along the cycle path, which then follows the shore of a lake, Spiegelplas. about 2 km on, the cycle path turns away from this lake, to another lake (Ankeveense plassen). The church spire of Ankeveen is visible ahead, across the other lake. stop here, at the corner facing the second lake: 20 m to your left is a small wooden footbridge. Cross it, and go to the two benches with a view of the lake. This is a classic lake landscape of the western Netherlands. The lakes were created by turf cutting, from the late Middle Ages onwards. Around 800 AD, the landscape consisted of uninhabited peat bog, from the coastal dunes inland to the Gooi ridge. It was above sea level, with natural drainage. As the bog was reclaimed for farmland, the soil shrunk, making river dikes necessary. Then windmills were needed, to drain rainwater into the rivers (which were now higher than the adjoining land). Turf cutting lowered the ground level even more, and the flooded turf cuttings became new lakes. Some were reclaimed again, from the 17th century onwards. Sources used here, for the settlement / landscape history of the region include Atlas Amsterdam (1999, C. Dijkstra, M. Reitsma, A Rommerts. Bussum: THOTH), and the provincial survey Monumenten Inventarisatie Project Noord-Holland, published by the Provincie Noord-Holland. go back from the benches, back to the concrete cycle path, and continue. Further on, pass a small brick building beside a weir: it is a pumping station. just after the weir, at the signpost, turn left across the narrow footbridge: follow the sign for Hilversum, and for cycle route junction 38.
continue along the narrow path (Bergse pad). It looks like a footpath, but legally it is a cycle path. at the end of the path you are on the village street of Ankeveen: turn right, toward Hilversum. Ankeveen is a linear settlement typical of the reclaimed peat bogs: the land was reclaimed in regular patterns. 500 m on, at the road junction, go on toward Hilversum. Cycle on along this road for 2 km, to the village of ‘s-Graveland. at the end, cross the bridge, and go straight on into the narrow road beside nr 40A (Ankeveense Pad, no sign here). 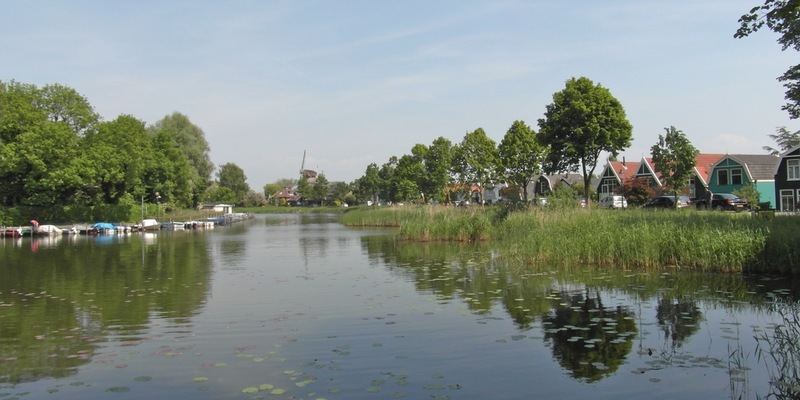 Like Ankeveen, ‘s-Graveland is also a linear village, built along a canal. It was a favoured place to build country houses for the 17th-century elite of Amsterdam. The name means “the Count’s land”, the s-apostrophe is a relict genitive case, absent in modern Dutch. the narrow road continues through fields. At the end, turn right, follow the sign for Hilversum. This road is slightly higher than the fields, which you just passed. Here it forms the landscape boundary, between the former peat bog, and the generally forested Gooi ridge. after just 40 metres, turn off left, onto the cycle path, into the Spanderswoud nature reserve (Goois Natuurreservaat Spanderswoud). cycle straight on through the wood. The wood is on sand and gravel, with remnants of former sand dunes. West of the landscape boundary, in the early Middle Ages, there was nothing but bog, creeks and mud flats from here to Haarlem. The marshlands of Holland were one of the last areas in western Europe to be settled. The Gooi ridge is a glacial ridge pushed here by the Saalian Ice Front – the edge of the Scandinavian ice cap during the Saale ice age, about 200 000 years ago. The ridge extends to the Rhine at Rhenen: the section east of Utrecht is known as the Utrecht ridge, ‘Utrechtse Heuvelrug’. the path ends at the edge of Hilversum: turn left along Bach laan. cycle along Bach laan: the Hilversum television tower is visible above the trees. It is part of the national broadcasting centre, now the privatised Mediapark. stop at the small kiosk De Boshut, where the road bends left. Turn right here, into Bussumer grintweg (“gravel road to Bussum”). Follow the cycle route sign for junction 54, but check the street name sign, don’t go into Kroon laan. follow the signs, number 54 in a circle, through the upper-income areas of northern Hilversum. First along the Bussumer grintweg, then left into Trompenberger weg, then left into Jacobus Penn weg. 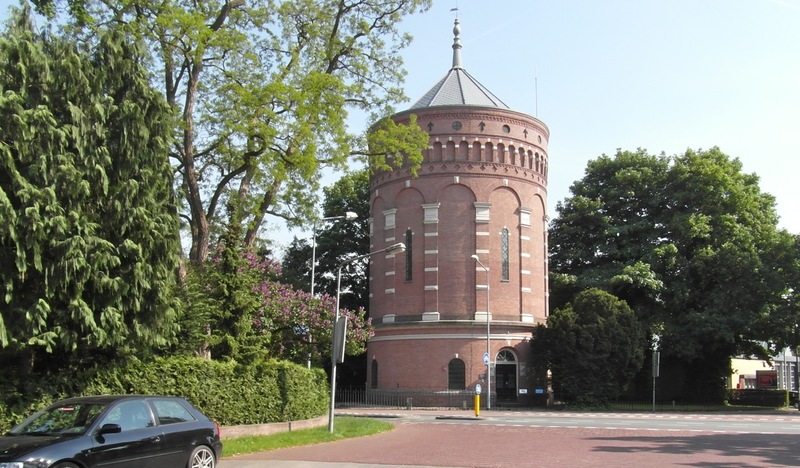 at the circular water tower, cross the inner ring road of Hilversum, go straight on. The tower was built in 1893: this is the highest point in Hilversum, at 27 m.
at the end of this street, turn right into the Hoge Naarder weg, the ‘high road to Naarden’. This is a ‘cycle street’, with priority for cyclists. 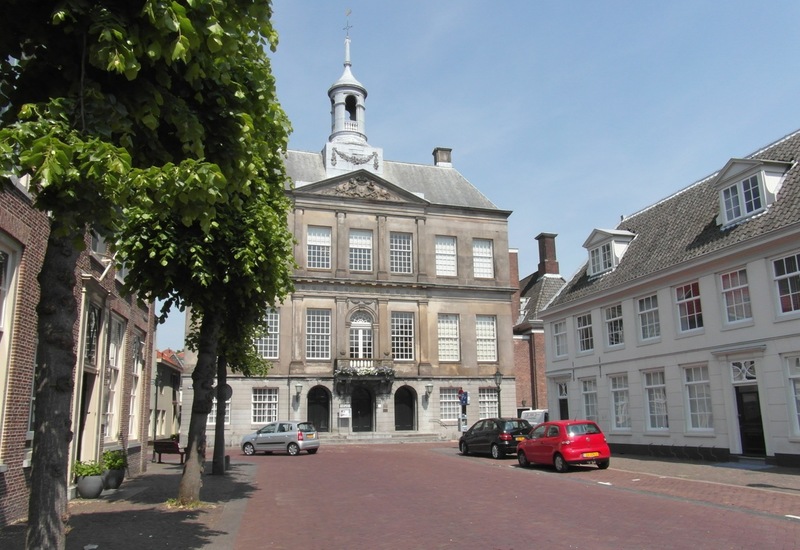 The Town Hall is a prominent example of early 20th century Dutch architecture, by Willem Marinus Dudok. 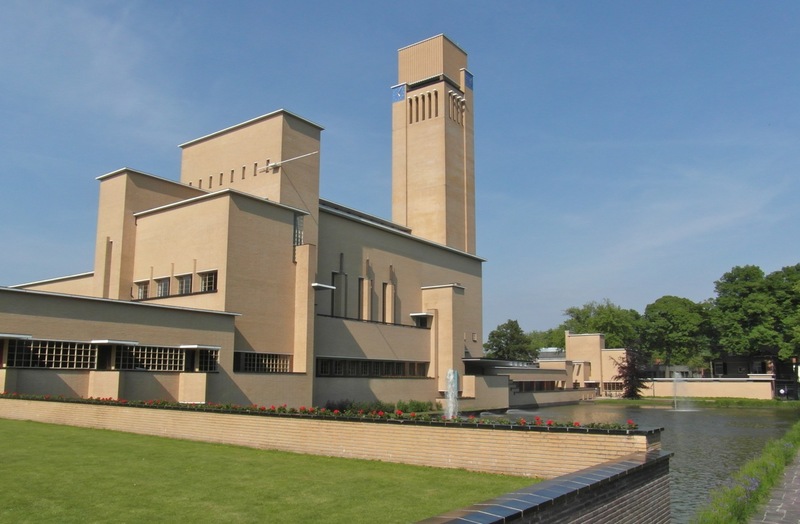 Hilversum expanded in the 1920’s and 1930’s, and has many examples of the architecture of the period. In the grassed open space is a small monument with sunflowers, for the 15 Hilversum victims of Flight MH17, shot down over Ukraine. go straight on, over the red asphalt (indicating cycle priority). At the end of the open space, turn left along Melk pad, a one-way street with two cycle lanes. pass (left) the St. Vitus Church. The road then bends right, past the recently reconstructed market square. The old building at the bend, originally a garage, has been rebuilt as a food hall, Mout. after the bend, turn right at the boulders, into the wide street with shops, restaurants, and cafés. This street is called simply Groest, but there is no street name sign at this corner. If it is busy, you may have to step off your bike. 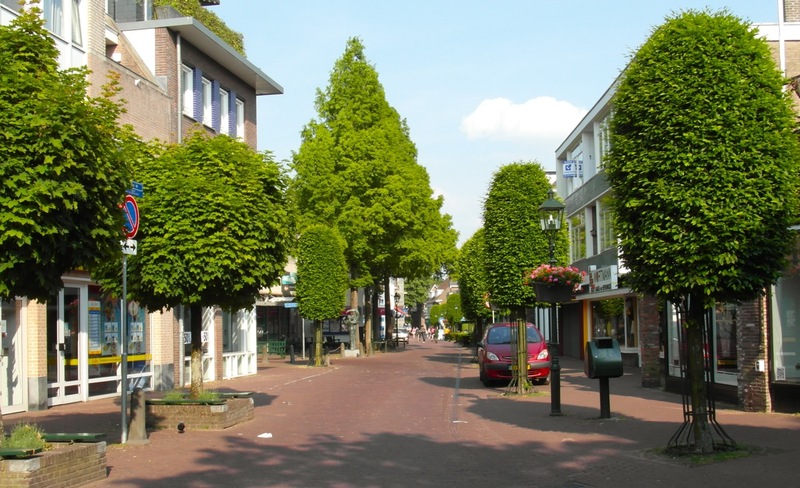 Groest is the old high street of Hilversum, which was only a small town, on the heaths of the Gooi ridge. It never received city rights, and for centuries sheep grazing and wool-working were the most important activities. Hilversum began to expand in the late 19th century, when the rail line from Amsterdam attracted wealthy commuters to the area. In the 1920’s and 1930’s, it became the centre of broadcasting in the Netherlands, and the economy is now dominated by the media and related sectors. turn next left into Leeuwen straat: follow the pedestrian sign for ‘Station’. This street is a pedestrian zone. at the end of Leeuwen straat is Hilversum station. Go straight on, on the cycle path, through the new cycle tunnel under the station. on the other side, the cycle path climbs back to street level. Turn right here, into Kleine Drift. go straight on along Kleine Drift. At the end, turn left, along the wider street with two cycle lanes. Confusingly this section also called Kleine Drift, but there is no clear sign. Don’t turn into Lorentz weg, and don’t go into Ehrlich straat. continue along this radial road. About 200 m further, as you pass the new housing, the name changes to Minckelers straat. continue along Minckelers straat, on out of Hilversum. About 2 km from the station, you leave the built-up area, and the road continues through a wood, towards Baarn. follow the curving road through the wood, and pass under the A27 motorway. After the next bend, the road is straight: you are now in the Province of Utrecht. cycle on out of the wood: the return to grassland marks the edge of the forested Gooi ridge. pass a tree nursery, and then turn right into Wildenburg laan. Follow the sign for cycle route junction 22.
go straight on, to the grounds of Groeneveld Castle. Pass the small car park, and then turn left along the unsurfaced cycle path, lined with trees. follow the path on alongside the ornamental lake. At the end, turn right: you are at the front of the ‘castle’, in fact an 18th-century country house. It is now a publicly-owned centre for nature and landscape. (You can rest in the grounds, open to the public). at the castle gates, turn your back to the castle, and cycle away from it, along the tree-lined former avenue. At the end of the castle grounds, you can see the first buildings of Baarn. cross the main road, and turn right along the cycle path. (This is a one-way path, and you are cycling the wrong way). Go toward Restaurant Greenfields and the petrol station. pass the petrol station forecourt, and immediately go through the gap in the fence, with a barrier to deter cyclists. At the barrier is a faded sign for Van Heemstra laan. It is easy to miss this gate. If you are 30 m from the petrol station, then you missed it: turn back and look again. 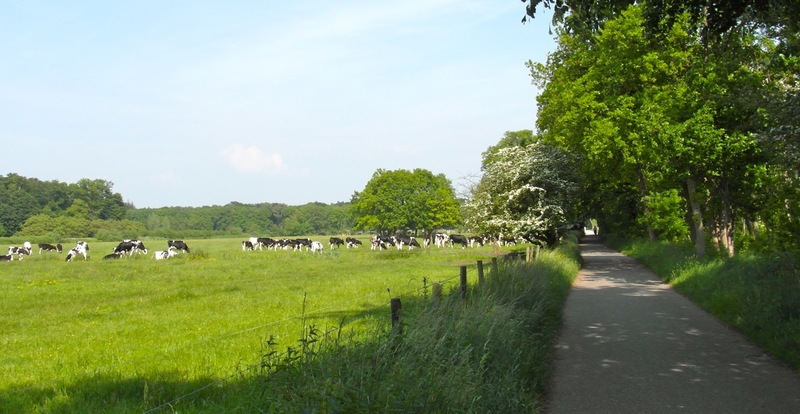 go straight on along this road through Baarn – first along Van Heemstra laan, and then Eemnesser weg. Baarn is built at the edge of the forested ridge. Since the coming of the railway, it has been an upper-income town, especially because of its association with the royal family. 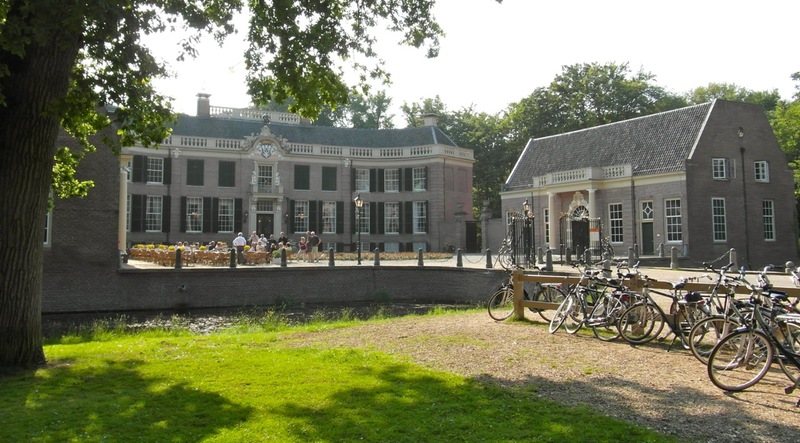 Soestdijk Palace is on the outskirts of Baarn, and ex-Queen Beatrix went to school here. at the roundabout in front of the police station, turn right, into Nieuw Baarn straat. at the shops, at Café De Karseboom, turn left into Laan straat, the old village street of Baarn. continue along the Laan straat, but step off the bike during shopping hours. Food: shops, supermarket at nr. 87.
at the end, at the square with the bandstand, go toward the HEMA store. In front of the HEMA, turn right, past Gall & Gall, and Etos. at the next corner, go straight on, follow the cycle sign for Amersfoort, onto Bos straat. Go on along Bos straat, cross Java laan, and go straight on along Ooster straat. after the last block, at the corner of Ooster straat and Dotterbloem laan, turn right onto the unsurfaced cycle path (beside the pond). Mind the ducks! at the end of the path, go straight on along Zuring laan. at the end of this street, there is a cycle bridge on your left. Turn left, follow the sign for Amersfoort, across the small bridge, into open countryside. cycle on along this road, Bremeentje. The Amsterdam – Amersfoort rail line is on your right, on the left is the open land of the reclaimed Eem delta. The land was regularly flooded in historic times, although the Eem is a short river. Between the high ground of the Gooi/Utrecht ridge, and the high ground of the Veluwe, is a low-lying area, the Gelderse Vallei. A channel of the Rhine once flowed through here, and if the Rhine dike west of Wageningen broke, then the Rhine would again flow into the Eem, causing widespread flooding. Even earlier, before the Saalian glaciation, the river Maas flowed through the valley: the ice sheet deflected its course. (After Amersfoort, this route goes through the Gelderse Vallei, along its main drainage canal). pass Grote Melm, a cluster of historic farmhouses on the bank of the Eem. continue along the road parallel to the rail line. To the right is the village of Soest, built on the edge of higher ground. Visible ahead is the spire of the old Amersfoort cathedral, the Onze Lieve Vrouwe Toren. The apartment tower (on the left) is the northern point of Amersfoort. The city extends north-south, and you are looking at it ‘from the side.’ Because of its visibility, the Amersfoort spire was used as the centre point of the triangulation of the Netherlands. It is the true origin point of the national grid, located at 52° 09′ 22.178 north, and 5° 23′ 15.5 east. further on, the road (now Hilhorst weg) turns away from the rail line, and then goes under a power line. the road then turns back toward the railway line. At the end of this road, turn left into Amersfoort, through the industrial zone of Isselt. go straight on to the traffic lights, and cross the main road (Amsterdamse weg), into Plataan straat. on Plataan straat, turn third left into Noorderwier weg. The street gets wider, and further on it is the main street through the neighbourhood, with shops. This is Soesterkwartier, a low-income neighbourhood built on the ‘wrong’ side of the railway yard. after the shops, you pass an 11-storey pink/yellow block, Puntenburg. Keep to the right here, along Puntenburger laan. continue along Puntenburger laan, to a cycle underpass under the rail line. The houses on the left are new: this is a former industrial area ‘behind the station’, now fully redeveloped. go under the rail line, and up the ramp. As soon as you reach street level, make a U-turn, on your left-hand side, back toward the railway. At the railway, turn right along the cycle path (alongside the tracks). pass the old station of Amersfoort (Amersfoort NCS, the white building at nr 15). The station was relocated in 1904, the new station is behind you. go on past the new office building, to the river. (This is the National Cultural Heritage Service, Rijksdienst voor het Cultureel Erfgoed). keep left, and cross the cycle bridge over the river Eem – alongside the rail bridge. On the right is the Koppelpoort – a preserved late-mediaeval city gate. To the left of the gate is a weir, controlling the water level in the old city. turn right, through the old city gate, under the coat of arms, into the historic centre of Amersfoort. 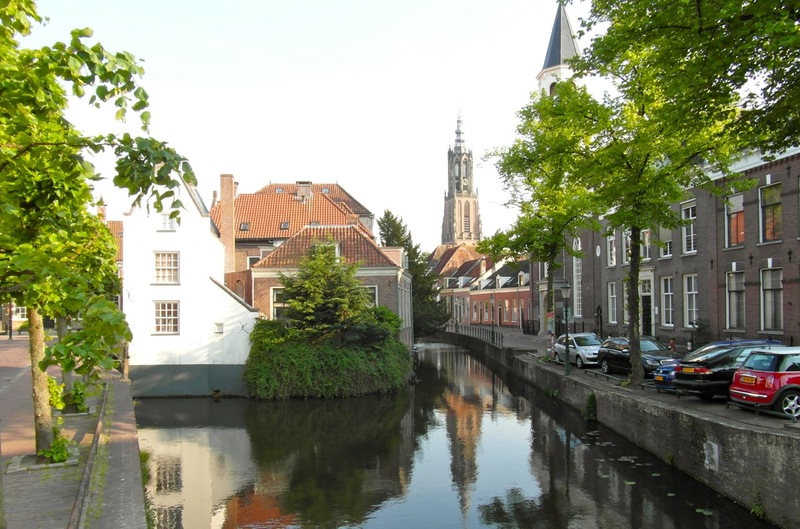 Amersfoort grew up around a ford on the river Eem, formerly called the Amer. The Eem is formed by five streams draining the Gelderse Vallei, which meet here. The ford was just east of the higher ground of the Gooi ridge, on the easiest route across the low ground, to the high ground of the Veluwe. The flow of the Eem was later diverted around the city to avoid flooding, and the water now flows through a modern drainage canal fed by the Vallei kanaal, which this route later follows. go along the canal, the old course of the Eem. This was the city’s harbour. at the end go left, then right, onto the short Nieuwe weg. At the end of Nieuwe weg, turn left along Havik. Both sides of this canal are called Havik: you should be on the right bank – i.e. cycling past Havik 17 and 19.
go right from Havik into Lavendel straat. At the end of this street, you are at the main square, Hof. turn left, go past the church, into Zevenhuizen. cross the Lange straat, the main street of Amersfoort, straight on into Nieuw straat. Lange straat is the old main road from Utrecht to the eastern Netherlands and Hannover, the road which crossed the ford in the Eem. at the end of Nieuw straat, turn left along Muurhuizen. The street is named for its wall houses built on the remains of a city wall. Amersfoort was granted city rights in 1259, and the first circular city wall was completed around 1300. When the growing city built a new wall in the 15th century, the old wall was ‘recycled’ as the rear wall of houses. That resulted in the circular street. The old city of Amersfoort was part of the Prince-Bishopric of Utrecht within the Holy Roman Empire. The territory of the Prince-Bishop – the Sticht – comprised the Nedersticht around the city of Utrecht, and the Oversticht (‘over’ the IJssel river). Later the Counts of Gelre/Geldern acquired the Veluwe region, cutting the Prince-Bishopric in two. The three territories gave rise to the modern provinces of Utrecht, Gelderland, and Overijssel. stop at nr. 59, go into the archway beside this house. (The next house after nr 59 is numbered 99). pass through the arch: it is recent, but the building dates from 1434. Cross the cobblestone bridge, over the former moat (of the early city wall). from the footbridge, turn left and then right, into Sint Andries straat. at the traffic lights, cross the Stads ring, the inner ring road of Amersfoort. Go straight on into Heiligenberger weg, an old road out of Amersfoort to the south. continue along the newer, wider, section of Heiligenberger weg, follow the cycle signs for Leusden. At Beethoven weg, cross to the right-hand side of the road. follow this road, on out of Amersfoort, and over the A28 motorway. The wooded area after the motorway bridge is Heiligenberg itself, ‘Saints Hill’. go straight on, and pass the country house Lockhorst (now offices). At the traffic lights turn left, into Burg de Beaufort weg: follow the cycle sign for Stoutenburg. continue along Burg (Burgemeester) de Beaufort weg, into Leusden. This is the north end of the suburbanised village, the old village centre is further south. cross Groene Zoom, and go straight on. At the end of Burgemeester de Beaufort weg, at the crossing with Zwarte weg, go slightly right, and then straight on, to the new shops. go straight on, between the new buildings. Last shops for 20 km! You cycle onto Ashchatter weg, again go straight on. cross Midden weg, and continue along Ashchatter weg, to exit Leusden. After the last houses, cross the new cycle bridge. 50 m further, turn right along Kanaal weg, the canalside road. 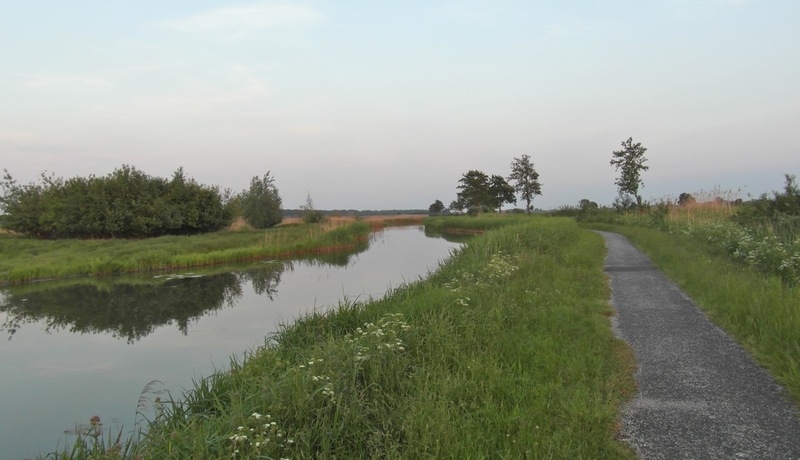 This is the Vallei kanaal – the main drainage canal of the Gelderse Vallei. It drains into the Eem at Amersfoort (north of the historic centre). from here you follow the Vallei Kanaal for about 12 km, to the Utrecht- Arnhem rail line. Be careful crossing the roads that intersect the cycle path. The present version of the canal was built in the 1930’s, but it was originally cut between 1473 en 1481, under David of Burgundy, son of Philip the Good, Duke of Burgundy. He was Bishop of Utrecht from 1456 to 1496. The canal was earlier known as the Grift or Grebbe, the name ‘Vallei Kanaal’ is recent. The opposite bank of the canal appears to be higher, but in fact the ground level is the same on both sides. This section of canal was fortified in the 1930’s, by building a raised bank with bunkers. That upgraded an older defensive line, the Grebbelinie, first built in the 18th century. It was an inundation defence line on the flank of the Utrecht ridge, flooding the land to the east of the Grift in wartime. (The land on your left, about 3 m above sea level). The Grebbelinie saw heavy fighting in 1940, during the German invasion of the Netherlands. Parts were briefly refortified by German forces in 1945, as Allied forces advanced from the east. The inundation zone was kept free of buildings, to provide a clear field of fire, and it is still relatively open landscape. The Gelderse Vallei is an area of intensive pig and poultry farming – and a stronghold of orthodox-Calvinist Protestantism. 6 km along the canal, pass a weir with fish ladder. The water flows towards Amersfoort, you are cycling slowly uphill (about 6 m rise from Amersfoort to Wageningen). The tree-lined raised road (left) is a compartmentalisation dike – for dividing sections of inundated land in wartime. Diversion early 2019: path closed, follow the yellow diversion signs with the letter B. Turn left into the tree-lined road, then right at the crossing. When you reach the main road, N224, turn right along that road. After about 300 m, at the small white two-storey house, turn left to rejoin the canalside path. if the canalside path is open again, just continue past the weir, on along the canal, and then cross the main road (N224). continue along the canalside path. About 9 km along the canal is cycle route junction 81, at the crossing with Nieuw straat. Behind the stone cone is a grassed area with benches, a good place to stop and rest. continue along the canal. After cycle sign nr 24235, the asphalted canalside cycle path ends. Turn right over the bridge here, follow number 22.
after 200 m turn left, along De Steeg, again follow number 22 (look out for the sign). This road runs parallel to the canal. 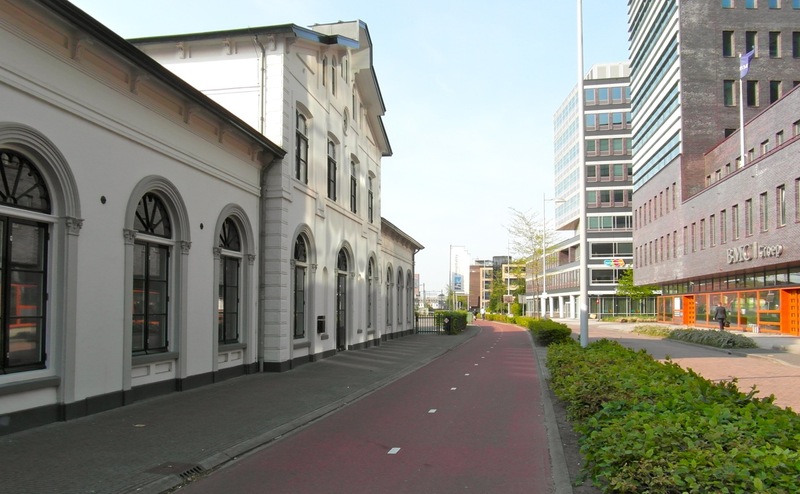 at the end of this road, you are at the rail line Utrecht – Arnhem, the main line to Germany (opened 1845). Turn left, follow number 23.
after 2 km alongside the railway, the road goes uphill: stop at the crest of the hill. This is the Emminkhuizer berg – an isolated glacial feature. Although it is only 22 m high, and about 15 m above the surrounding land, the ‘hill’ at Emminkhuizen is the only high ground in the Gelderse Vallei. It was settled early, partly because it was safe from flooding. From here you can see the higher ground on both sides of the valley. after the hill, the road turns away from the rail line: don’t turn onto the cycle path here. The road then turns south toward Veenendaal, passing under the motorway. after the motorway, pass (left) a garden with alpacas and wallabies, and then turn left into Veenendaal, along Munniken weg. after 100 m, you are again cycling alongside the old canal (this section is still called the Grift). continue straight on along Munniken weg, for more than 1 km. At traffic lights, cross the west ring road of Veenendaal. About 100 m after these traffic lights, turn first right into Dahlia straat. cycle downhill along Dahlia straat, and turn left just before the supermarket, along Panhuis. Food: in the supermarket, or 5 minutes later in the town centre. cycle straight on along Panhuis, then Zand straat, into the town centre. This is the old east-west road into Veenendaal. go straight on through the square: the Hoofdstraat or main street is on your right. at the end of the pedestrianised street, go on to the cycle path, at the four boulders. Keep right here, follow the cycle sign for Wageningen. You are now on Verlaat: the street name sign is on the new block, at the boulders. go straight on away from the centre, along Verlaat, and then along Vallei straat. They form a long straight road, out of Veenendaal. at the end, at the blocks of flats, follow the signs for Wageningen, and go through the cycle underpass tunnel. turn left at the end of the tunnel, cycle sign for Wageningen. You are now cycling alongside the Vallei Kanaal, again. continue along the canal, pass under the ring road, and cycle out of Veenendaal. This section of canal is called ‘Bisschop Davids grift’. at Meent dijk, the road turns away from the canal. At the next crossroads, turn right, back towards the canal (toward junction 27). back at the canal, cross the bridge, and immediately turn left, follow the cycle sign for number 27.
continue alongside the canal, at first on a farm access road, and then a narrow cycle path. Go on through open country, for 2 km. From 2019 the simple open landscape will disappear, to make way for a planned ecological park, the Binnenveldse Hooilanden. That will take several years to develop, and in the meantime it looks like a construction site. at cycle route junction 27, turn left across the bridge, and leave the canal behind you. Follow the sign for junction 2, and the low cycle sign for Wageningen. 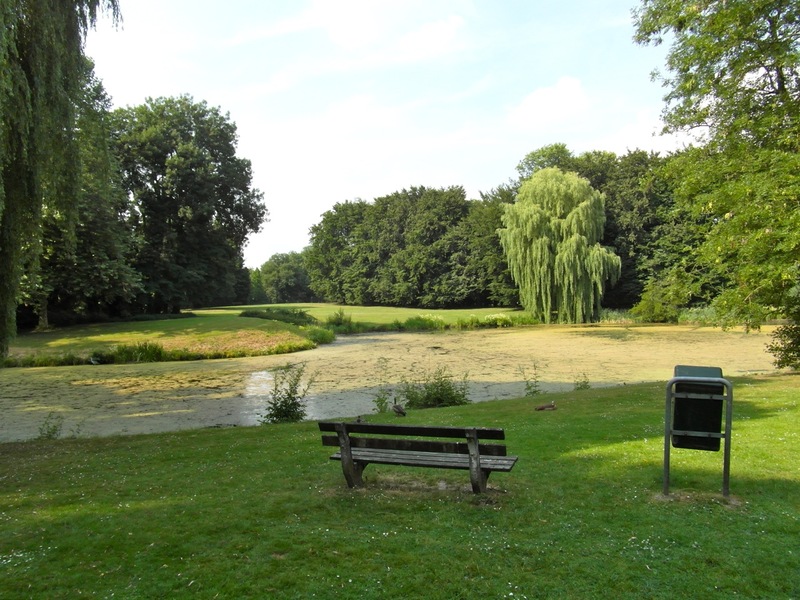 The canal forms the provincial boundary here, and you enter the Province of Gelderland. about 1 km further, you reach a T-junction. Turn right along Veen steeg, follow the sign for junction 13.
cycle 3 km along Veen steeg, a long straight road with one bend: the last section is now a cycle path. This was a beautiful tree-lined rural road (see image), but it has been effectively vandalised, as part of the ecological park plan. Only the last section retains the old trees. From here you can see the high ground on both sides of the the Gelderse Vallei (Rhenen and Wageningen). The valley is about 8 km wide here, but although the Rhine flowed through it, it is not an Urstromtal. The valley floor was not cut: the high ground on both sides was raised by glacial action. at the end, just before the bridge, turn left along the tree-lined canal. You now enter Wageningen. The buildings at the edge of Wageningen house food technology and biotech firms: the research themes of Wageningen University. at the end of this road, turn right. Use the new cycle path, not the access road. The cycle path runs parallel to the Wageningen ring road. continue alongside the ring road, for about 1 km. Cross the N225 (the main east-west road). Stay on this side of the ring road, now using a parallel access road. continue to the Hoogvliet supermarket. Food: in the supermarket, and 2 minutes later in the town centre. in front of the supermarket, turn left along Troelstra weg. Cross the ring road, and go straight on across a bridge, into the town centre. This street is called Wal straat. The bridge crosses the old city moat: the line of the bastions has been restored here. The line of the city walls and bastions is still visible on a map, forming a rectangle. Wageningen is built at a strategic position, where the western edge of the Veluwe ridge meets the Lower Rhine. It controls the old highway, from Utrecht to Arnhem via Rhenen. The town was fortified in the Middle Ages, as the western outpost of the Duchy of Geldern (Gelre in Dutch, see map). The Prince-Bishopric of Utrecht, across the Gelderse Vallei, was a rival of Geldern. Three of the ‘quarters’ of Geldern became part of the Netherlands in the 17th century, and form the modern Province of Gelderland. (The fourth ‘quarter’ is now divided between the Province of Limburg and Nordrhein-Westfalen). after the bridge, go on straight along Wal straat, past the memorial sculpture (on your right). Don’t turn left into Plantsoen. 200 m after the bridge, turn left into Hoog straat. There is no street name sign at this corner, but there is at the next corner. Step off your bike during shopping hours. continue along Hoog straat (high street), the old highway to Arnhem, and now the main shopping street of Wageningen. The historic centre of Wageningen was largely destroyed in May 1945, as Canadian forces advanced toward the western Netherlands. (The Ruhr was surrounded first, and then a part of the Allied armies turned north-west to enter the Netherlands). go straight on. At the end of Berg straat, just after the last shops, pass Hotel De Wereld, site of the Surrender at Wageningen. Since the 1950’s, Dutch schoolchildren have learnt about the dramatic events here on May 5th 1945: Generaloberst Blaskowitz surrenders the German forces in the Netherlands to the Canadian General Foulkes and to Prince Bernhard of the Netherlands. Ending five years of German occupation, the surrender at Wageningen is remembered as effecting the liberation of the Netherlands. 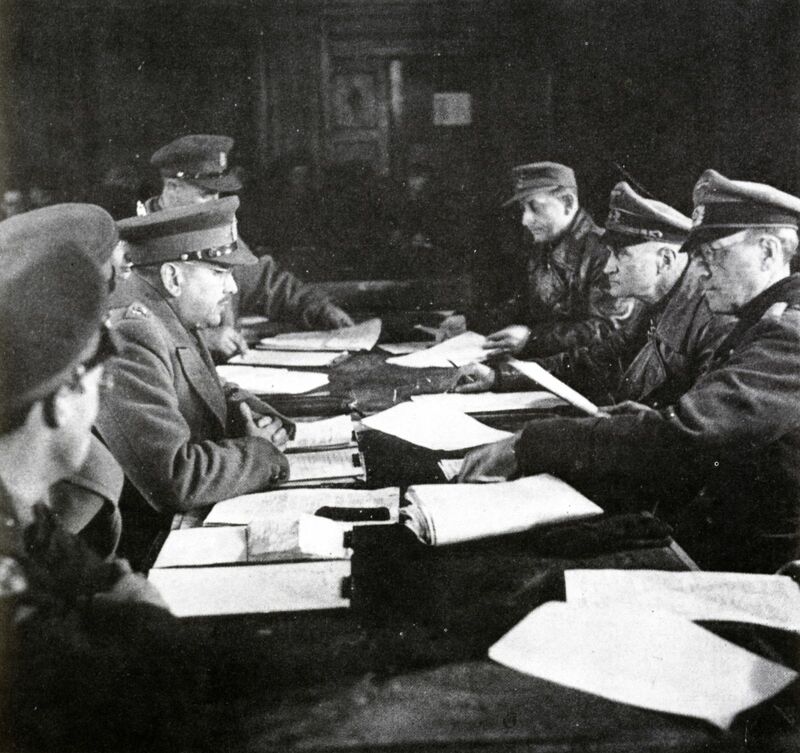 The only problem is, it never happened: all German forces in the Netherlands and northwest Germany had already surrendered to Field Marshal Montgomery, on the previous day. Both Foulkes (who later became Chairman of the Canadian Chiefs of Staff) and Prince Bernhard (who was originally German, and needed a patriotic image) later promoted the myth of the “surrender at Wageningen”. from the small square in front of Hotel de Wereld, turn right into Veer straat. (There is no street name sign, go right of the statue). Veer straat, ‘ferry street’, is the old road to the ferry over the Lower Rhine. at nr 19 go left: this is still Veer straat. at the end of Veer straat, continue along Veer weg, follow the sign (with the ferry icon) for Zetten. Veer weg is the exact edge of the Veluwe ridge, where it meets the flood plain of the Lower Rhine. The road is about 12 m above sea level: in a major flood, the water will come up to the right-hand side of the road. The Nederrijn or Lower Rhine is one of the the two main channels of the Rhine, which splits as it enters the Netherlands. The other is the Waal – which this route crosses later at Nijmegen. Together with the Maas they form the main river barriers between the north and south of the Netherlands. There was no land route between north and south until 1868 (rail line from Utrecht to ‘s-Hertogenbosch). continue along this road, at the edge of the fields. About 200 m after the last houses, turn right along Veer dam, to the Rhine ferry, Lexkesveer. The ferry here exists since the Middle Ages, perhaps replacing an earlier ford. The river bank may not be in exactly the same place, but in Roman times this was the main channel of the Rhine, forming the boundary of the Roman Empire or Limes Germanicus. cross the Nederrijn by the ferry: you are now in the Betuwe – the island flood plain between the two main Rhine channels. It takes its name from the tribe of the Batavians – the location and the tribe are mentioned in Caesar’s Commentarii de Bello Gallico. go on from the ferry, to the main river dike. The land outside the dike – the uiterwaarden – is flooded when river level is high. The Rhine peak flow is in the spring, fed by melting snow in the Alps. The road from the ferry landing to the main dike obstructed the flow, and it has been replaced by a bridge. at the main dike, first go straight on (road sign for Zetten). As you go down from the dike, turn right, into Hemmense straat. Follow number 53.
cycle on through the fields. About 3 km from the ferry, you pass a park on the left, with a small lake. There are benches at the lake, a good place to stop and rest. In the park are the ruins of Hemmen castle, and its restored herb garden. The castle was destroyed during the Second World War – the Betuwe was a front-line during the winter of 1944-1945, after the failure to seize Arnhem. just after the park, turn left into Hemmen, along Molen straat. at the church, turn right into Dorps straat, and pass through the small village. Hemmen is an early-mediaeval settlement, built on an ‘oeverwal’ – the raised bank of a former Rhine channel. It was formerly a small municipality, with its own town hall/post office, at Dorps straat 9-10. All the villages in the area, and the former castles, are on similar low ridges: some farms are built on a terp. Until the river dikes were built, the Rhine regularly flooded most of the region. This eastern half of the Betuwe, known as the Overbetuwe, was inhabited by Romanised Batavians in the Roman Empire: a temple and a Roman road were found at Elst, 11 km east of here. The area is now a single municipality, also called Overbetuwe. towards the end of the village, the road bends right. Just after the bend, turn next left along Zettense pad, the path to Zetten. at the end of the path, go straight on past the primary school, and then turn right, along the village street of Zetten. go on through Zetten, passing the shops in the centre of the village. Food: baker, cafetaria and supermarket. go straight on, past Wilhelmina plein, and on along Stations straat. Further on, there is a cycle path alongside the road. where the road bends left, go straight on, along the cycle path, until you reach the railway line. 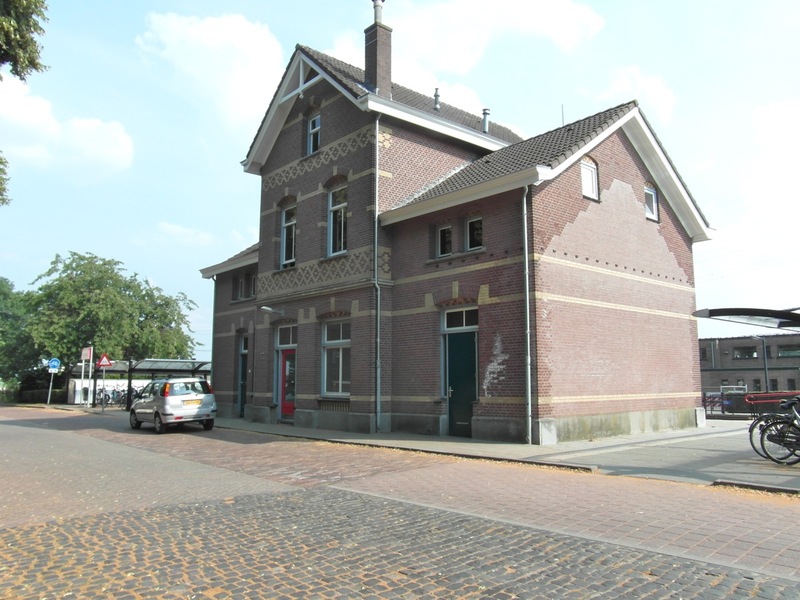 at the rail line, turn left, past the small station of Zetten-Andelst. Then turn right across the rail line, at the level crossing. This line, opened 1882, once carried international trains, but got left behind when traffic was concentrated on main lines between cities. It is now known as the ‘old Betuwe line’, to distinguish it from the new one. It is not electrified, and has an hourly passenger service from Tiel to Arnhem. The new Betuwe line is a purpose-built rail freight line, starting in the Rotterdam port zone. It connects near Zevenaar to the main line to the Ruhr. The line massively overran its budget, leading to a parliamentary inquiry. cross the A15 motorway: it also runs from Rotterdam to Germany. Go straight on, toward Andelst. stay on this road, which by-passes Andelst. Don’t turn off into the village itself. About 1 km after the motorway, pass the former town hall, an ugly two-story office building with a spire. 300 m after the town hall (at nr. 178), turn right onto Waal straat, cycle sign for Nijmegen. Don’t turn into Rozen straat here. cycle on out of the village, and on towards the motorway embankment. at the end of Waal straat, you are on the dike of the river Waal, beside the motorway bridge (north-south A50 motorway). The bridge was doubled in 2011-2013. It is now named after the Roman historian Tacitus, who first described the region. turn left under the motorway: you now cycle 10 km along the Waal dike, to the rail/cycle bridge at Nijmegen. The dike was reconstructed after the 1995 flood, when it almost broke at Ochten (15 km downstream). The entire Betuwe population, about 250 000 people, was evacuated for a week. 2 km further on, pass a lake in the floodplain (this is all under water during flood). Ahead, you can now see the Nijmegen power station. 4 km along the dike, pass the small white church of Slijk-Ewijk, now an art gallery (Galerie 1400) There is a long bench just below the dike, where you can stop to rest. pass the suburbanised village of Oosterhout. Visible on the opposite bank are the power station, a container dock, and the locks of the Maas-Waal canal. 9 km along the dike, pass under Nijmegen’s second road bridge, opened 2013.
just after the new bridge, pass a war memorial for the United States 82nd Airborne Division, and other Allied forces. They crossed the Waal here during the Battle of Arnhem on 20 September 1944. The new bridge (De Oversteek) is named after the crossing. The monument lists the names of US soldiers killed in action here: remember it, when you get to Zyfflich. pass (right) a recently excavated flood relief channel. Continue toward the railway bridge: behind it is a cycle bridge, but you can’t see it yet. go under the railway viaduct: stay on the road. Don’t use the waterside path. On the other side of the viaduct, there is a stepped metal ramp, up to the cycle bridge. go up the steps, and cross the cycle bridge over the Waal. Ahead is the old waterfront of Nijmegen. from the bridge, continue along the elevated cycle path. About 300 m from the bridge, you cross a road leading to the historic centre of Nijmegen with the St. Steven’s Church. This is the old highway into the city, possibly since Roman times. 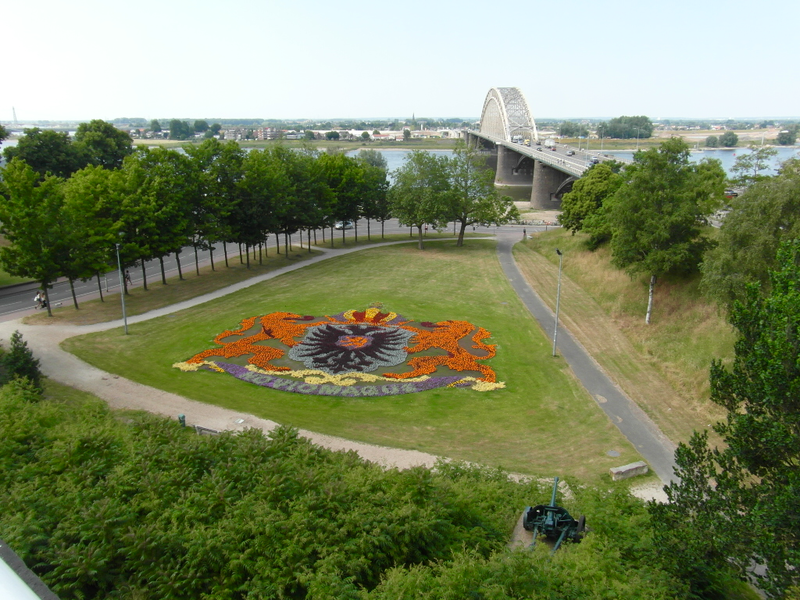 Nijmegen is a Roman city – Ulpia Noviomagus Batavorum – and might be the oldest city in the Netherlands, although Maastricht also claims that title. Later it was a Frankish and Carolingian centre, and a mediaeval trading city. From the Roman period only archaeological traces survive, and many older buildings were destroyed by bombing and shelling in 1944, but the city still has around 700 historic buildings. Since the late 19th century the city has expanded, especially since the opening of the (originally Catholic) university, in 1923. Nijmegen is built on the northern slope of a glacial ridge, where it meets the Rhine flood-plain. continue past the blue office building, the regional police headquarters. When you reach the street, turn left, past the three apartment blocks. (This is Stieltjes straat, but there is no sign here). at the next corner, again turn left, follow number 20. Use the cycle path, alongside Kronenburger Park. In the park is a mediaeval defensive tower, and remnants of the city walls. at the corner of the park, turn right, and then continue into the pedestrianised street, Lange Hezel straat. Don’t turn into Park weg. go uphill, along the Lange Hezel straat and the Stikke Hezel straat. This is the old road to the centre, which you saw from the elevated cycle path. Food: restaurants, bars, patat, and a small supermarket. After Nijmegen you pass no more shops. pass through the Grote Markt, the historic central square of Nijmegen. Behind it on your left is the 13th-century St Steven’s Church. go on along the Burcht straat, now the main shopping street, passing at nr. 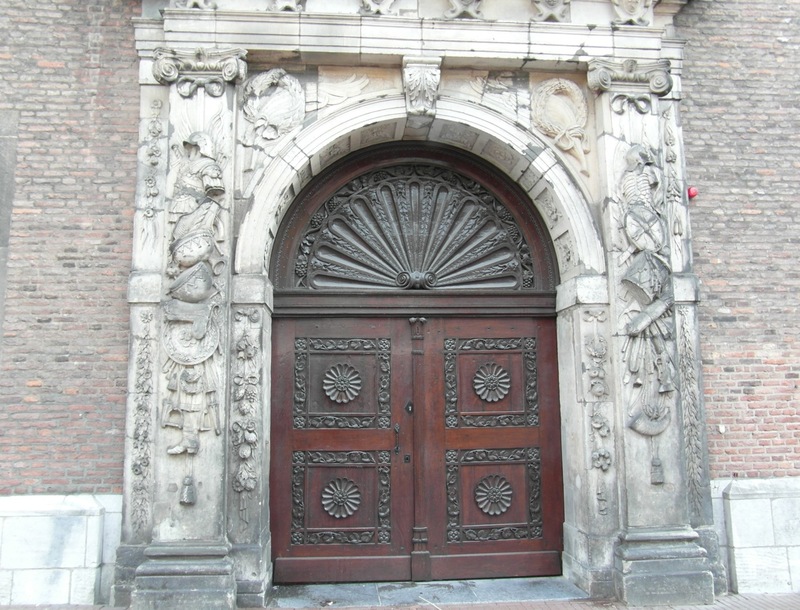 20 the restored Stadhuis (city hall, 1555). go straight on, past the open space at Kelfkensbos, past the blue facade of the city’s Valkhof Museum. 100 m after the museum building, turn left into the park behind it, at the snackbar/kiosk Hunnerpark (follow a pedestrian sign for Hunnerpark/Belvedere). go on along the footpath, in front of the city wall – this is the longest intact section. Nijmegen was heavily fortified for most of its history. In this small park, Hunnerpark, you can stop to rest. go left through the gap in the city wall, under the small arched bridge. Then turn right along the footpath, to the Belvedere tower – now a restaurant. go up to the platform, with an excellent view of the Rhine flood plain. This was once a defensive tower, at the point where the plateau slopes down to the river. Across the flood plain you can see Arnhem. It is built, like Nijmegen, at the edge of the glacial ridge. It was all formed as one ridge, and the Rhine originally ran north from the Rhine Gorge, and did not even flow here. Diverted by the ice in the last Ice Age, the river flew east, and it cut through the older glacial ridge. Until the Middle Ages, the Rhine flood plain was occupied by meandering channels over its entire width, here about 15 km. When the rivers were enclosed by dikes, the present double channel was fixed. Below the tower is the 1936 Waal road bridge. to leave Nijmegen, you must go downhill, and under the Waal bridge. From the Belvedere tower, go back along the footpath, but keep to the right, and pass the Museum entrance. continue along the right-hand edge of the square (with the wooden benches), to the blue sculpture. At the sculpture, make a U-turn right, downhill: follow the sign for Waal kade parking. approaching the river, go right, and under the Waal bridge viaduct: the road then turns to the right again. 300 m after the bridge, turn left onto the Ooyse dijk, follow the cycle sign for the LF3b Maas route, and for junction 48.
pass the 1933 German-Dutch pumping station, and immediately turn right into Dijkgraaf van Wijck weg, alongside the drainage canal. cycle on along the drainage canal. On your left is the reclaimed flood plain of the Rhine, on your right the wooded edge of the Nijmegen plateau. The Netherlands’ section of the flood plain is called the Ooij Polder. The river dikes never protected the area entirely, and it was often flooded when dikes broke. In the 1990’s, plans were made to use the entire area as a flood retention basin, sacrificing it to save more populated areas downstream. See the map at hoogwaterplatform.nl, the website of the plan’s opponents. Since the Netherlands can only use its own territory in this way, a large new dike would be built along the border. Earlier, in the 1950’s, the Ooij polder was planned for defensive inundation, in case of a Soviet invasion (see De Ooijpolder: een tragisch paradijs). after 2500 m, the road turns away from the canal. After another 100 m, there is a crossroads. Turn right here, toward the church, into Persingense straat: follow the sign for junction 63.
pass through Persingen, the ‘smallest village in the Netherlands’. On the right at the church, there is a picnic bench where you can stop to rest. Persingen is built on higher ground, a donk – former river dunes formed during the last ice age, the Weichsel glaciation. 700 m after Persingen, at the St. Hubertus weg, turn right, sign for Beek. after 600 m, before you reach the traffic lights, turn left, follow the sign for ‘Wylerbergmeer’, and junction 64. This is Alde Wetering weg: there is a sign with the street name, but it is offset from the corner. continue along Alde Wetering weg, passing two dogleg bends. Pay attention to the route, because you need to cycle back again, and it is not well signposted. at the large sheds, turn left. This is cycle route junction 64, you follow number 66. Pass sports fields, on your right. at the end of the sports fields, pass the entrance to Wylerbergmeer recreational area. Go straight on, along the concrete cycle path. just after these gates, cross a concrete bridge. Immediately after the bridge, turn right, along a rough clay/gravel track. There are no signs here. after 500 m on this unsurfaced road, you reach a grassed dike, about 2 m high. It is called Querdamm, transverse dike. The name is in German, because this is the border with Germany. There is a border marker on the right: 641A. The border with Germany is open, under the Schengen Agreement, and permanent border controls have disappeared, except for freight traffic. There are random checks by police near border crossings, and occasionally at the border itself. go straight on: after the border the road is surfaced. It is called ‘Zum Querdamm’. The houses along this road form the village of Zyfflich. Like Persingen, Zyfflich is built on an east-west ridge in the flood plain, about 5 m higher than the land on either side. It may have been settled in Roman times. at the fork with the cross, keep left, along Zum Querdamm. after 2 km, you enter the ‘centre’ of Zyfflich: the bar (Haus Polm), the church, the village hall, some benches on the grassed space, and maps of cycle routes beside them. The village is part of the Gemeinde Kranenburg and all shops and services are in Kranenburg itself. (It is a small historic town on the Nijmegen-Kleve road, about 7 km away). 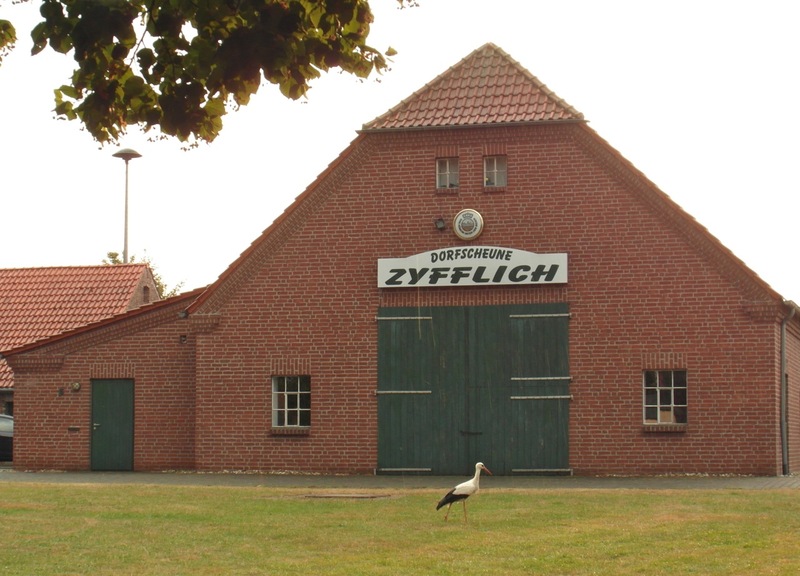 Zyfflich is known locally, as the place where storks returned to the Lower Rhine, in 1996. The stork was once common here, but had disappeared during the first half of the 20th century. The pioneer stork, which nested at Zyfflich in 1996, apparently died during the cold winter of 2010-2011, but there are now several nests in the region. The nest at Zyfflich also has new inhabitants. If you stop at the benches, facing Haus Polm, then it is behind the trees, about 100 m to your left. Occasionally, you might see a stork on the grassed open space. go to the church to see the war memorial with the names of the local dead. You are in another country, with a different history: these are the people killed by the 82nd Airborne, and other allied troops. They were ‘the enemy’ for the Dutch and their American allies, but many have Dutch names, and would have had relatives across the border. Like so many borders in Europe, it divided an older regional cultural unity. you are 129 km from the Dam in Amsterdam – from here you turn back to Nijmegen. to return, go back back along Zum Querdamm, starting beside the benches. go back through the gap in the dike (Querdamm), across the border, onto the unsurfaced road. Turn left when you reach the asphalted cycle path. Go over the bridge, and on along the cycle path. go on past the sport fields, and turn right at the next corner (at cycle route junction 64), back along Alde Wetering weg, toward junction 63.
at the end of Alde Wetering weg, turn left toward the traffic lights. cross at the traffic lights, and immediately turn right, on the cycle path alongside the main road. You now follow this road into Nijmegen. continue along the cycle path, and then the parallel roads, beside the main road. Even when you are almost in central Nijmegen, there are few buildings. The road is at the foot of the ridge, with the flood plain on the right-hand side. at the end of the parallel road, follow the cycle path across the main road. The path then turns, to continue alongside the road. continue uphill, alongside the main road, using a cycle lane. You should be cycling on the right of the road: using the lane on the wrong side is dangerous. at the top of the hill, you are back at the city centre, opposite Hunnerpark. Follow the cycle signs for Venlo, onto the inner ring road, the St. Canisius singel / Oranje singel. continue along this wide road, to a very large roundabout (Keizer Karel plein). go to the right, around the roundabout, to the corner with the theatre and the VVV tourist office. Turn next right, passing the entrance to the underground car park ‘Keizer Karel’. at the end of this street, 10 km from Zyfflich, is Nijmegen station, the end point of this route. This entry was posted in Cycle routes and tagged Amsterdam, cycle route, Netherlands, Rhine, Zyfflich. Bookmark the permalink. This is an excellent site. Thank you! I wanted to find infromation on leaving the EuroVelo Cycle Route to Cycle to Amsterdam. And here is all the info. in one place. Again, my thanks! R.C. do you have directions for the route from Zyfflich to Amsterdam?? Did you ask that before? I deleted a previous question and answer. 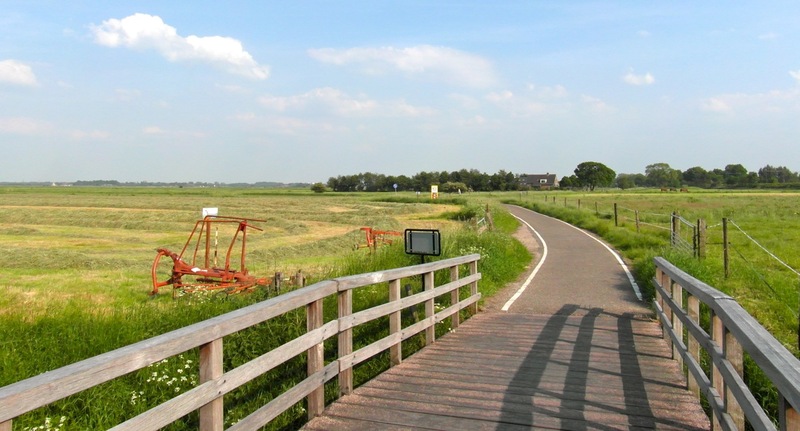 The answer is no, but if you want a cycle route from the Rhineland toward Amsterdam, then you can use the Rijnfietsroute – which includes sections of other national cycle routes.